Typhoid Drink Recipes, What can we drink with Typhoid? 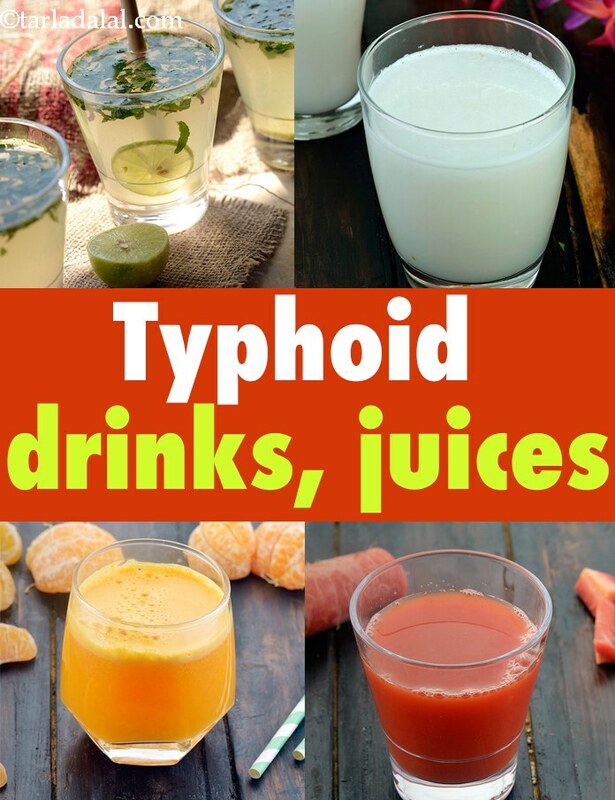 Typhoid Drink Recipes, healthy typhoid juices. Fluids should be consumed more frequently as they help to flush out toxins through urine. Juices give you antioxidants, which are important for building immunity. Having drinks will also make up for the water loss that occurs due to diarrhoea and will maintain water-electrolyte balance in your body. Liquid diet for Typhoid in stage 1 is strained juices. When suffering from typhoid, it is very important to stay hydrated because there is a lot of water loss due to diarrhoea. So we have some strained healthy juices like strained sweet lime juice recipe, homemade strained carrot juice recipe, homemade strained apple juice recipe and homemade strained orange juice recipe. You can have fruit juices like the Pineapple, Apple and Cucumber Juice, which can be strained or prepared in a hopper to remove excess fibre if you have diarrhoea. Vitamin C rich juices with ingredients like oranges, such as the Muskmelon and Orange Juice can will help boost your immune system. Buttermilk, strained barley water and coconut water in the form of Coconut Water with Coconut Meat can also be taken. Digestive aids like Lemon Phudina Paani and Minty Honey Lemon Drink are good options to soothe the stomach. Milk-based drinks can be taken if milk is tolerated well as these will add a lot of protein to your diet. You will enjoy drinks like the My Fair Lady. But avoid these strictly if you have diarrhoea. Enjoy our Typhoid Drink Recipes, healthy typhoid drinks and other typhoid recipe articles.